Yours. Mine. His. Hers. Ours. You now know what I've talking about with possession. What you thought I meant the demonic kind? That's just creepy! But I digress. 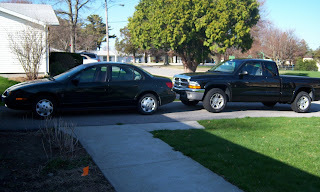 We're fortunate enough to own two vehicles. I can't imagine trying to get by with one vehicle. It would drive me bonkers! I know short drive. And I know there are people out there who do it, but I'm not one of them. I like being able to jump in the car and go whenever I want. The car is "mine" and the truck is "his". Really their "ours". The truck was bought with the thought that it could tow a boat. And it was what the hubby wanted. Yes we do own a small boat so we can tow it. And hey I got the car that I wanted so I'm not grousing here. Sorry that was a side road again. I seem to be going down a lot of them on this post. Hey I'm without a map! Oh that was a bad one. My apologies. Back on track I promise! Since moving to Rhode Island things have changed a bit. The hubby has been driving the car more than the truck. It's all due to the rising gas prices. The car is cheaper to fill up than the truck and doesn't chug-a-lug the fuel like the truck. I don't blame him, but I miss the smallness of the car. The truck feels huge when you drive it. He doesn't always take the car, so that's okay. The car is much better suited for the small streets of Newport than the truck, so it gets a bit more use.